In the Book of Daniel in the Tanach (Bible – Old Testament) we read h ow God gave Daniel the interpretation of dreams which king Nebuchadnezzar had. These dreams were pictures of what would happen in the future. In one dream, the King saw the statue of a man who was divided into four parts. G_d showed Daniel that these four parts were four great world Empires that would successively come. These began with the Babylonian Empire which was conquered by the Medes and Persians. They in turn would be conquered by the Greeks. The Greeks would eventually be overtaken by the Romans. In the 600 years between the Tanach (Old Testament) and Brit Chadashah (New Testament), events took place exactly as God had said in the book of Daniel. In 539BC, Babylon fell to King Cyrus, the Persian. Then between 334 and 323BC, Alexander the Great, the Greek ruler, conquered a vast area of the Middle East. Alexander was convinced that Greek culture could unify the world and so his plan was to force Greek culture onto all the peoples that he conquered. Greek culture was full of mythology and idolatry, the worship of many gods. It was very pagan and immoral. Alexander tried to use assimilation to make everyone like the Greeks. 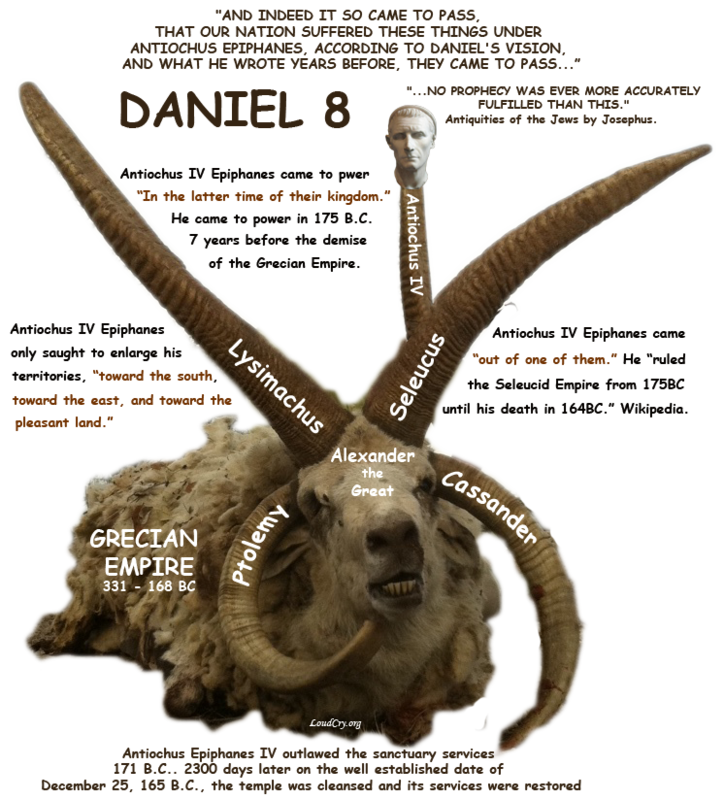 Alexander died at the age of 32, and his kingdom was divided among his four generals, just as one of Daniel’s visions [of a goat whose prominent horn was broken off and four horns grew up in its place] had predicted. A small horn grew and became very great and this prediction was fulfilled in the person of Antiochus Epiphanies – a cruel king who took control of the area which included Israel. He made a systematic attempt to wipe out all traces of Jewish culture and religion and replace it with Greek culture and idolatry. Antiochus was determined to remove all traces of Jewish faith. He erected a statue of the pagan god Zeus in the Temple and on 25th Chislev he offered pigs on the holy altar. Jews were forbidden to keep the Sabbath or any of their Festivals, the Scriptures were ordered to be destroyed, and these laws were enforced with utmost cruelty. One day, in 186BC, the soldiers of Antiochus arrived at the little village of Modin, just outside Jerusalem. They expected the aged priest Mattathias to set a good example to his people by coming forward to offer a pagan sacrifice. When Mattathias refused, a timid Jew came forward to perform the sacrifice. Enraged, Mattathias approached the altar and killed both the Jew and the General of Antiochus. With his five sons, Mattathias destroyed the heathen altar then fled to the hills to avoid reprisals. Others soon joined them. When Mattathias died, his son, Judah Maccabee became the leader. For the next three years, the guerrilla band waged a continual war against the soldiers of Antiochus, although greatly outnumbered; they finally recaptured the city of Jerusalem. They entered the Temple and removed all signs of paganism. The altar to Zeus was ground to dust and they rededicated the Holy Temple to Adonai Elohim (the Lord G_d). This happened on 25th Chesliv (Kislev), exactly three years from the day when the Temple had been defiled. They deci ded that they would celebrate the Feast of Succot (Tabernacles) straight way as they had been unable to do so because of the fighting. The story of the miracle of the oil is a tradition among the Jewish people and it is why it is sometimes called the Festival of Lights. The tradition is that when they decided to light the Menorah – the great golden Lampstand – for Succot that they could only find one cruse of consecrated oil. Although the oil was only enough for one day a miracle took place and the Menorah stay alight for all eight days of the Festival.